In an interview ahead of her transition from Head of Diversity and Inclusion (D&I) at ITN to Global Head of Diversity and Inclusion for the Financial Times (FT), Priscilla Baffour shares her journey as a diversity leader, reflecting on the challenges she has overcome, her successes and vision for the future. Referencing her early experiences as a media student and later broadcast journalist graduate, Priscilla described the initial challenges she faced pursuing a career in media. “There was a clear financial and economic divide between my peers and I, who despite also being students, already had a foot in the door through their parent’s network.” Priscilla describes the additional cultural pressures applied by her parents; “you must work harder than your white peers” and also the burden she felt she placed on them, relying on the bank of mum and dad whilst she worked for free in the industry, to get experience. Her 6th Form Tutor, who later became her mentor helped her secure work experience at the BBC, this provided her with an insight to the industry yet she reveals that there were still significant information barriers, particularly understanding how different departments work and how to effectively manage relationships with industry contacts at the age of 16. Whilst Priscilla expresses gratitude for having her tutor as a mentor, she also recalls a defining moment during this period. Understanding the challenges that young people experience at the start of their working lives prompted Priscilla to actively be part of the solution. Whilst working at the Media Trust, she pioneered a new area of outreach work that effectively partnered young people aged 16-25 with media companies who would provide work placements and mentoring support for disadvantaged young people who wanted to pursue a career in media. She also worked across campaigns such Breaking into News and Column Idol. This provided a platform for young people to express their views on community issues. The Sun, ITV and Channel 4 were a few of the many partnerships that she managed. The impact of her work was both beneficial to young people but also businesses that were keen to demonstrate their commitment to corporate social responsibility. Her talent was recognised by Channel 4 who welcomed her expertise and provided her an opportunity to extend her knowledge and transform the experiences of young people entering both the workforce and media industry. As the face of 4Talent, Priscilla was a visible inspiration for young people, black people and women keen to work in media. Yet Priscilla quietly observed that whilst she was achieving success, particularly accelerating opportunities for young people, the roles were primarily entry-level. Looking around the company, she recognised how intimidating the environment could be for a young person who was not used to working alongside busy industry professionals. As a young leader, Priscilla was keen to see young people and those from disadvantaged backgrounds enter the industry due to their creative competence rather than merely on their length of service. Leading on the development of 4Talent, Priscilla worked to embed a strategy that supported the recruitment and retention of diverse talent. 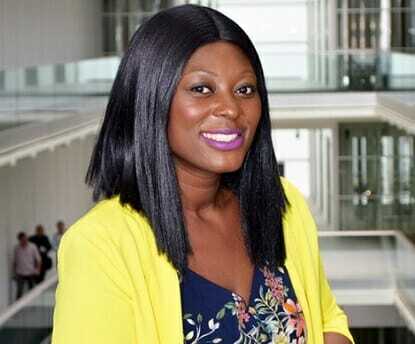 She was part of the team responsible for implementing Channel 4’s 360 Diversity Charter and she also won the Deputy Prime Ministers Excellence Award for tackling social mobility. Speaking with admiration, Priscilla acknowledges that Channel 4 was a great place to really effect change; they had a clear commitment to improving diversity and embed a culture of inclusion. When asked what her biggest challenge was, Priscilla takes a moment to pause. After leaving Channel 4, Priscilla founded We Do Diversity. Her exceptional media contact list that included BBC, Sky, ITV, MTV, The Sun, News International and many more provided her with the opportunity to continue to identify and source the best diverse talent for media businesses. She provided consultancy, coaching, mentoring training and led on bespoke industry events. Yet, it wasn’t long before her expert skills were yet again required on a more permanent basis by ITN. As a wife and mother, Priscilla recognises the importance of work life balance and flexible working for all. She shared that one of the approaches to recruitment at ITN is not advertising whether a job is full-time or part-time but instead being open and negotiating with the right candidate, what works best. Priscilla expressed that she is aware that unconscious bias exists. As the newly appointed Global Head of Diversity and Inclusion for the Financial Times, Priscilla describes being pleasantly surprised at the diverse landscape. Priscilla Baffour is due to take up her new role at Financial Times in March 2019.